Most popular yacht trip to a small beach located close to Bogmalo beach to its south. It is located at a distance of 7 kms. from Vasco city. Hollant beach is located within a shallow bay that has a gentle slope towards the sea. There are no currents flowing here and the beach is very safe for swimming. During low tide the beach area substantially increases since the slope of the beach is gradual and shallow. Further into the sea, fishermen often anchor their boats. Due to the shallow draft of the water at this beach, it is a favorite amongst families. Often families can be seen frolicking in the shallow water and enjoying themselves. There are just a couple of beachside shacks at this beach. One can only travel here with private yacht or speed boat. The beach is well connected by road though. To the left side of the beach, a small trail through a hillock which leads to Cansaulim beach. The Hollant beach in Goa attracts huge crowds of visitors and tourists specially honeymoon holidaying in Goa. It is known to be the only beach in Goa where one can see a sunrise. Those visiting Bogmalo beach never miss this magnificent beach. 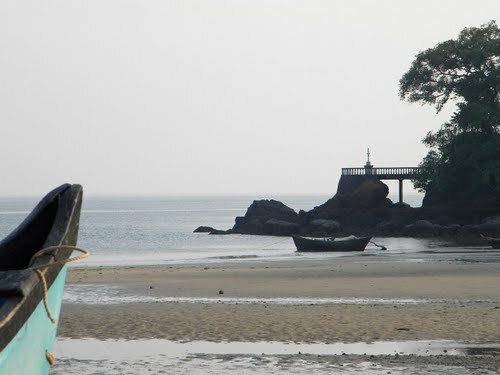 The Hollant beach, 2 km away offers beautiful views encompassing the main southern beaches of Goa, along with the foothills of the Western Ghats. Apart from the serenity and the view, the sunset is really spectacular here.